China Glaze Endurance is the last of the 3-piece "Fight Like A Woman" breast cancer awareness set launching in September. 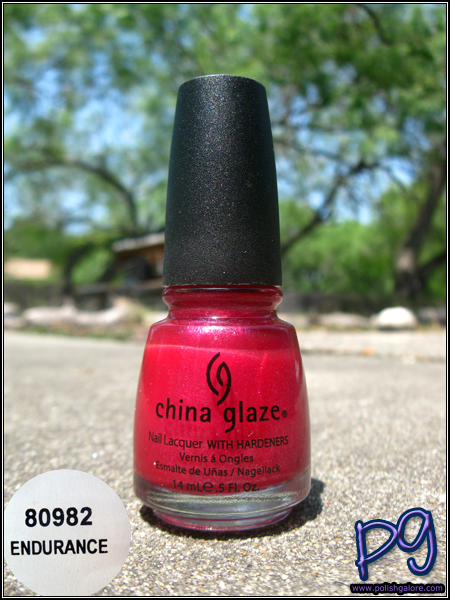 China Glaze says it's a raspberry shimmer but to me, it looks just like the 2009 Summer Days glass fleck collection. I was a little surprised by this color - it's not a traditional pink that you'd see for BCA, but at the same time, it's a nice unique color for both fall and just in general. I found the formula on this one to be a little thick as well but I'm wondering if it has anything to do with the heat in my house. I'm going to have to check a few more bottles in my house to see. I used a base of Seche Natural, 3 coats of Endurance and a top coat of Seche Vite. You can see that glass fleck in the sun, and just a tiny bit of VNL although it's always hard to tell with nubbins. In the shade it looks a bit more like a shimmer but overall I'm quite happy with this color. It's not as red as Cherry Pie but I do want to see how it stacks up with Raspberry Festival (both from the Summer Days collection). I'll let you know! this is very pretty on you! i don't think it'll suit me so much...but i LOVE those glass flecks!